Today, I have a great eastern Canadian recipe to share with you: Hot Chicken Sandwich Recipe. This recipe reminds me of my childhood. My mom used to make this for us growing up. She used to make it with two slices of regular white bread, left over chicken, and store bough gravy. I liked the taste, but not the texture. First it was too much bread for me, and second the bread became a bit soggy with the sauce. So I took what I liked from the recipe, and changed what I didn’t like: the bread. To make my Hot Chicken recipe, I use 1 piece of bread instead of two, and I select a country style bread so it never gets soggy. I also make my own gravy, but it’s o.k. 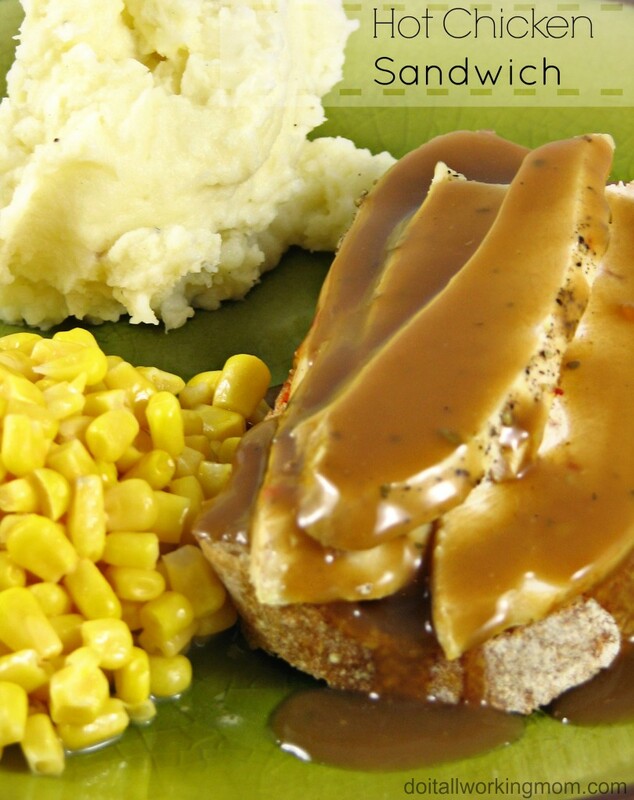 to use store bough gravy if you’re in a hurry. Place each slice of bread in a plate. Cover with a generous amount of sliced chicken. Drizzle with a generous amount of gravy. Serve with mashed potatoes or fries, and corn or peas. (You can find my delicious mashed potatoes recipe HERE). 1 1/2 cup of gravy (you can find my gravy recipe HERE. Serve with mashed potatoes or fries, and corn or peas. (You can find my delicious mashed potatoes recipe HERE. This recipe is delicious; my kids finished their entire plates. « We’re going to Walt Disney World!